We continue our survey of nibs with pens that are not nearly as flexible as those surveyed in the spring issue. Nibs reviewed there could make shades wide and wider. Pens examined here will make shades 1/32 to 1/16 of an inch at best. The majority of them were aimed at the large and lucrative school market. This is a huge category. 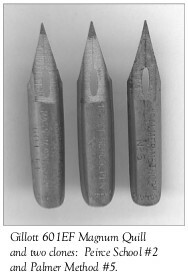 Nibs selected are small enough to be used in an oblique penholder. With few exceptions, schools used straight holders. Moreover, IAMPETH members stand a decent chance of finding nibs from this group at a reasonable price. I also left out pens with turned-up points. These are very rigid and more suited to business penmanship. That will be the subject of next issue’s survey. Fine and Not-So-Flexible nibs are great for delicate, finely shaded writing that can be very elegant. Since these pens are so similar, they will be reviewed by manufacturer. In the winter survey of Fine and Flexible Nibs, nibs still made today were highlighted in bold type. This time, bold type won’t be needed. Of all the pens surveyed here, only the Gillott 1068A Rigid and Leonardt Hiro 41 are still made. The 1068A is not as stiff as the name implies and is roughly the same flex as the Hiro 41. They are the benchmark for flexibility since each is so easy to find. The Leonardt nib stands alone among the company’s nib line for this survey, but there are other Gillott pens to be considered. Look for the Number 41 and Number 81 School Series pens. Another is the 1066 Registry Pen, which has an extra fine point. All are excellent. Every pen in this group is typical of Esterbrook’s terrific quality. One of the company’s best sellers was the 556 School Medium Firm, a great nib that never seems to wear out. Similar with a slightly finer point is the 782 Natural Slant. 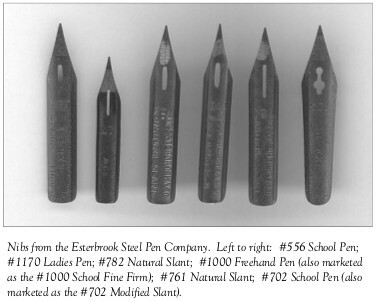 The #1000 School Pen (also marketed as the Free Hand Pen) is another excellent nib as is the 761 Natural Slant. The 702 School Pen is wider with a point that is not as fine as others listed here. Still, it is a superb writer and very durable. Another to look for is the 1170 Ladies Pen, a nib very similar to the Gillott 1066 Registry Pen. It is smaller and has a super fine point. Hunt made the #21 Companion Pen with a fine point that rivaled the Esterbrook 1170 and Gillott’s 1066. Three other nibs to look for are the #59 University Pen, #67 Sixty-Seven Round Pointed Pen and the #5 Droop Point. All might be considered medium point, but are good writers. 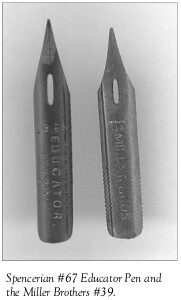 Eagle, a New York City company that made some excellent nibs, were strong in the school market. Their E870 Muscular Pen, E840 Modern Writing Pen and E760 Scholastic Pen are fine pens. One more to consider is the E710 Transcript Pen. This nib is very similar to the Esterbrook 702 in that it is wide with a medium point. The A.N. 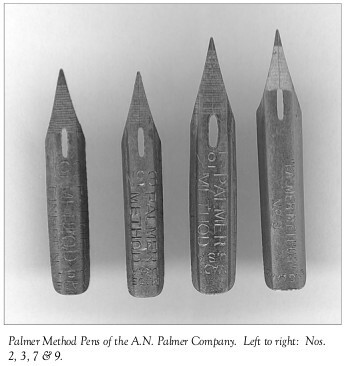 Palmer Company of Cedar Rapids, Iowa, marketed a sizable line of nibs to complement its Palmer Method writing programs. Palmer Method pens were excellent writers, made by Gillott. The #2 and #3 are virtual twins with little no difference in size or flex. The #7 and #9 are larger and are nearly twins. The #9 might be slightly more flexible. All will make a very fine hairline. Miller Brothers of Meridian, Connecticut, #39 is a fine pen. The Spencerian Pen Company #67 School Series is also a superb nib. C. Brandauer & Company of Birmingham, England, made many great nibs. The #134 Post Pen is a good writer. Two more pens worthy of consideration are larger than the others mentioned. The Globe Pen, #536, is a smaller version of the bowl-pointed design and works in an oblique penholder. A medium point, it has good flex. Brandauer’s Review Pen, #183, is a gold plated pen. Brandauer made much use of gold for their nibs. The Review Pen also has a medium point and its length makes it more suited to larger oblique holders. This is a decent sampling of a very large category of nibs. No doubt, some have been overlooked and members are invited to let me know about pens they use that aren’t covered. I have tried to select nibs that appear from time to time on Ebay and are more likely to appear in flea markets or antique stores. Thanks to Jim Chin of Lemont, Illinois, for sending some Brause 67EFs and 76s. These are fantastic nibs!!! The 67 is an arrow nib like the Brause 66EF reviewed previously, but larger. With an extra fine point, it has the flexibility of the Gillott 604EF class. The 76 isn’t quite as fine, but just as flexible. Each nib is quite long at 1 7/16” for the 67 and 1 1/2” for the 76. They work well in large holders such as the 5/8” Century Oblique. Both pens are great writers, but neither is made any longer. 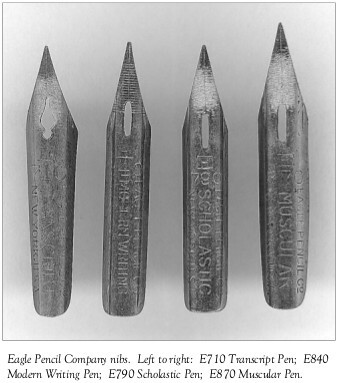 I encourage Brause to think about re-issuing these terrific nibs. Kay Purcell of Carbondale, Illinois, sent along a Soennecken 1355EF. This is a very long nib—1 3/4 inches. However, the length of the nib is not as important as the amount of the pen that protrudes from the flange of the penholder and whether the nib’s point may be centered on the pen staff. I was able to use the 1355EF on a 5/8” Century Oblique holder and it was very good. It is very fine and quite flexible. I found it great for offhand flourishing as it can make a very thick shade. One of the nicest nibs I have found is the Gillott 601EF Magnum Quill. Though long, 1 7/16”, it is extremely fine and very flexible. It can make a shade to rival the Gillott Principality. I have discovered two clones spawned from the Magnum Quill. Gillott made pens for the A.N. Palmer Company and the Peirce School of Philadelphia. The Palmer Method #5 and the Peirce School #2 are identical to the Gillott 601EF. 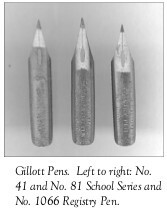 Gillott also made pens for the Frederick W. Tamblyn School of Penmanship in Kansas City, Missouri. When you look at the photo of Tamblyn’s #00 Superb Pen and the E-Z Writing Pen, they appear to be identical. Indeed they are except that the E-Z Writing Pen is bronze in color. 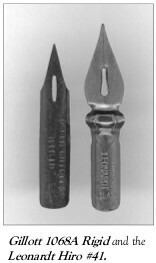 Both pens are clones of the oldest style of the Gillott 303. As such, they have extremely fine points and are quite flexible. They are also comfortable with smaller penholders. The Esterbrook Steel Pen Company had a terrific nib with its #453 Business and College Pen. It is similar in design and style to the Gillott 601EF, but is not quite as flexible. Still, it is a great pen and is a nib that seems to appear on Ebay from time to time. Another great writer is the Blanzy-Conté-Gilbert No. 172F Montgolfier. It is a long nib at 1 9/16”, but works well in large penholders. A pen that is comfortable in a smaller penholder is the Palmer Method #8. Though very flexible, its point is not as fine as others in this update.